Atlantic Yacht Basin’s experienced crew and comprehensive facilities are ideally suited to addressing all of your maintenance and protection requirements for any size vessel – large or small. 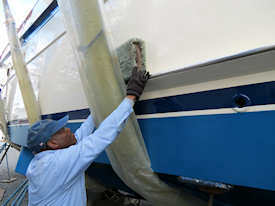 From routine engine and systems checks and upkeep to seasonal commissioning and detailing to regular work on your bottom, deck and exterior surfaces, Atlantic Yacht Basin can make the annual hassle of getting your boat ready for the on- and off-seasons a much more convenient and cost-effective process. We can also identify issues upfront and help you develop a maintenance plan that is likely to save you time and money in the long run, while preserving the maximum value and enjoyment of the boat you love. With both storage and repair capacity in one great location, we are also an authorized dealer and licensed repair facility for most major marine brands and stock many parts and materials on site in our marine store. Most importantly, we know boats, inside and out and are a trusted source for service and advice on a wide range of different kinds of yachts and commercial vessels.